avg. 3 tae 5 puppies. 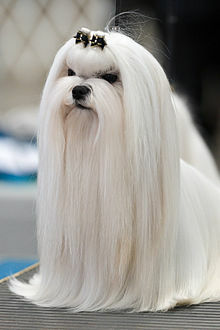 The Maltese is a smaa breed o dug in the Toy Group. It descends frae dugs oreeginatin in the Central Mediterranean Aurie. The breed name an origins are generally unnerstuid tae derive frae the Mediterranean island naition o Maltae; houever, the name is sometimes describit wi reference tae the distinct Adriatic island o Mljet, or a defunct Maltese toun cried Melita. ↑ 1.0 1.1 Davis, Peggy (translator) (1999-06-04). "Maltese". FCI standard No. 65. Retrieved 2009-04-14. ↑ "Maltese". Animal Planet dog breed directory. Retrieved 2009-08-29. ↑ Drury, William (1903). British Dogs - Their Points, Selection, and Show Preparation. L. U. Gill. pp. 575–581. ISBN 978-1-4067-7606-5. Retrieved 2009-04-14. ↑ Lee, Rawdon Briggs (1894). A history and description of the modern dogs of Great Britain and Ireland. (Non-sporting division.). London: H. Cox. pp. 312–322. ↑ Hyytinen, Iiris. "Maltese - A Mean Little Toy Dog". Retrieved 2009-04-14. ↑ Cramer, John Anthony (1828). Geographical and Historical Description of Ancient Greece. Clarendon Press. pp. 45–46. Retrieved 2009-04-16. This page wis last eeditit on 7 Mairch 2014, at 07:41.